Hotel Meninas is located in a historic building dating from the 19th century. It has been totally refurbished and transformed into a hotel, but still keeping the decorative and structural elements of the epoch when it was built. The hotel is very centrally located and therefore it is very easy to visit the historic part of the city, la “Villa y Corte” (the area of the court and city council). The hotel is near to numerous places of historical, cultural and shopping interest. 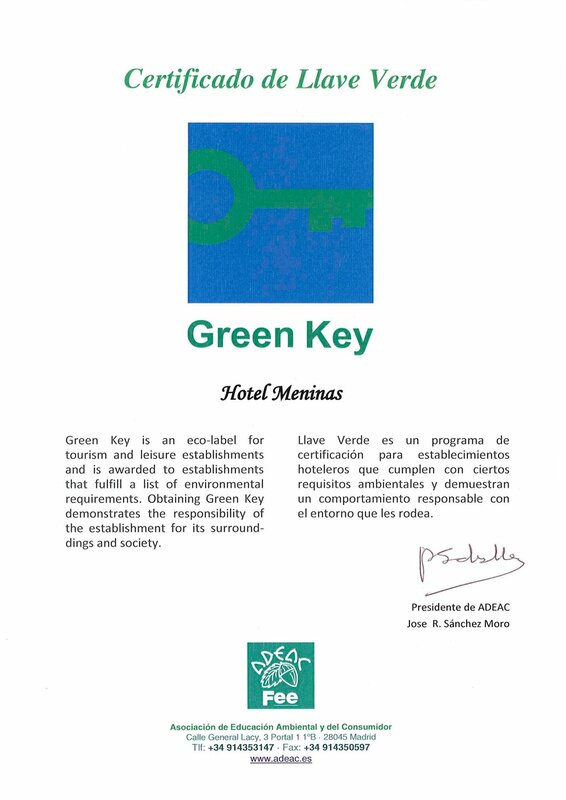 Hotel Meninas has 37 sound-proof bedrooms: Suites, Triple rooms, double rooms, double rooms with two beds, and indiviudal rooms. All the rooms are fully equipped, decorated with all types of little details and have the latest technology. All the bedrooms have individually controlled air-conditioning, interactive satellite plasma TV, a safe, a mini-bar, a hairdryer and a smoke detector. We also offer a free internet cable connection in all the bedrooms, and a wi-fi connection in the public areas. There are bedrooms for non-smokers, and also for handicapped people. Breakfast is only included in the room price for all reservations made through the hotel’s official web page.